'MyPeople' might be a sign of a more empathetic Microsoft. One of the more intriguing things Microsoft announced this week wasn't fancy new hardware. It was a simple addition to the Windows 10 task bar: small icons representing the people you interact with the most. They could be your family or friends, but for whatever reason, they're important to you. Dubbed MyPeople, it's a way for you to easily share just about anything on your computer with those folks, be it files, links or a cute emoji-like notification. And, it gives you a central place to keep track of interactions with those people, whether they take the form of emails or Skype chats. 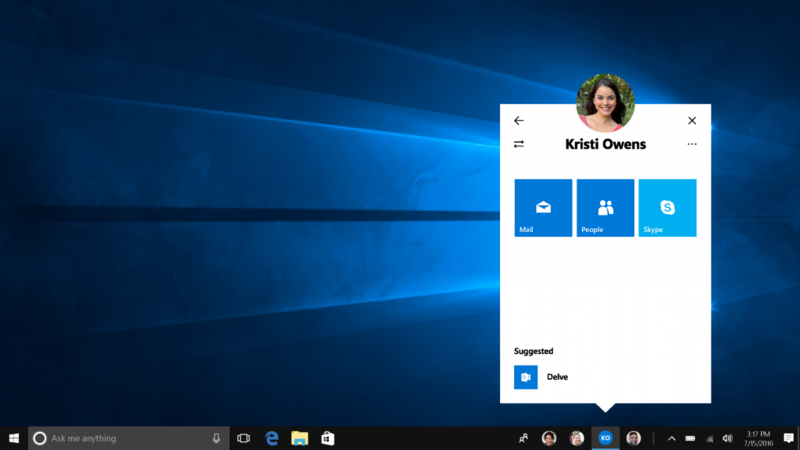 While it might seem like just a minor addition to the upcoming Windows 10 Creators Update, the utility of MyPeople is striking. It's the sort of mundane thing lots of folks would actually use; which isn't something you can say about Windows 10's flashier features, like built-in game broadcasting. And with its focus on people and reinforcing social bonds, it also helps shift Windows drop its stodgy, business-focused image in favor of something friendlier. As Microsoft's Allison O'Mahony tells it, the feature came about after conversations with Windows users revealed most of them mainly interact with a handful of people. "We started thinking about what could we do to build that same relationship, and build it within Windows," she told Engadget. That led her team to think about ways to complete common tasks, like sharing, with more immediacy. "These are people we are highly interruptible for," she added. On top of her research, MyPeople also follows CEO Satya Nadella's belief that Microsoft needs to think about building a more human operating system. "What's more human than the people who make up our day-to-day lives?" O'Mahony noted. In general, she says Microsoft is now thinking more about how it can be more empathetic towards users. You can look at the "Shoulder Tap" feature in MyPeople as another way to reinforce your social connections. Basically, it lets you send adorable notifications to your friends that resemble emojis. But on a deeper level, it's meant to simulate the way you'd gently hold a friend to encourage or support them. It's a navel-gazing notion, for sure, but it's surprising coming from a software giant like Microsoft. I'm used to hearing concepts like that from young startups. In some ways, the feature seems like a more focused version of the social network Path, which also emphasized connections with your closest contacts (first with up to 150 friends, and later up to 500). Path was a change of pace from the social media urge to acquire as many followers as possible. MyPeople takes that notion even further to focus on a handful of contacts. The ability to see everything related to your friends in one spot could potentially make you more mindful as well. It's another way to avoid missing an important email or IM. MyPeople's prominent positioning on the Windows 10 task bar shows how much Microsoft is betting on it. Cortana was the last feature to take up such prime real estate, and that virtual assistant is now part of the company's core software strategy across several platforms. O'Mahony describes the task bar as "beachfront real estate," and she's well aware of the pressure of managing such an up-front feature. There's the potential for MyPeople to be widely adopted, but if it doesn't take off it'll be a prominent failure. Without the chance to test MyPeople extensively, it's hard to judge it just yet. But there's certainly potential for it to change the way people use Windows. It also seems like something that could work well on other platforms, like the Xbox One, iOS and Android. We're overloaded with social connections everywhere, and there's a need for apps that keep you focused on the people who actually matter to you. In a similar vein, MyPeople could also help Cortana learn more about your close friends. O'Mahony says her group is "having conversations" with the Xbox and Cortana teams, but there's nothing to say yet about any potential integrations. "When we think abut these people, it's almost like we're talking about a wearable," O'Mahony said. "They're really in a container. Where you go, you really want to take them with you."